Download "Operating Systems for Parallel Processing Assistent Lecturer Alecu Felician Economic Informatics Department Academy of Economic Studies Bucharest"
1 Operating Systems for Parallel Processing Assistent Lecturer Alecu Felician Economic Informatics Department Academy of Economic Studies Bucharest 1. 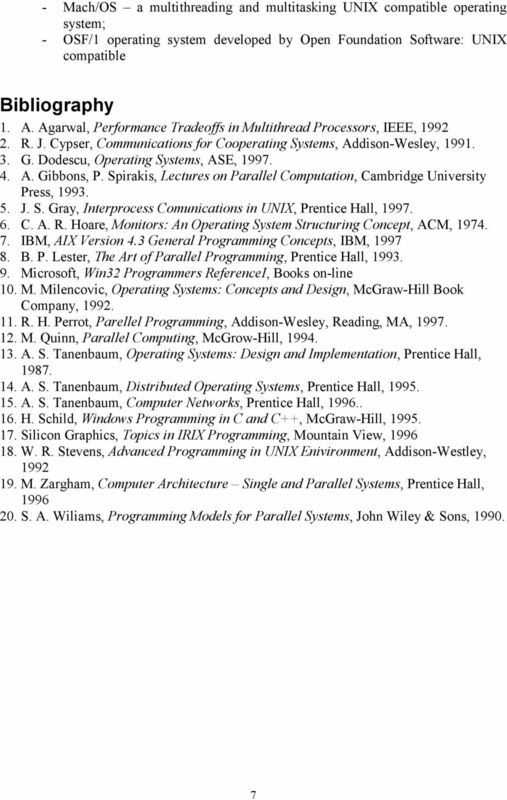 Introduction Few years ago, parallel computers could be found only in research laboratories and they were used mainly for computation intensive applications like numerical simulations of complex systems. Today, there are a lot of parallel computers available on the market used to execute both data intensive applications in commerce and computation intensive applications in science and engineering. Applications from our days have growing computational needs. As computers become ever faster, we can expect that one-day computers will become fast enough. However, new application will arise and these applications will demand faster computers. In our days, commercial applications are the most used on parallel computers. A computer that runs such an application has to be able to process large amount of data in sophisticated ways. These applications include graphics, virtual reality, decision support, parallel databases, medicine diagnosis and so on. We can say with no doubt that commercial applications will define future parallel computers architecture but scientific applications will remain important users of parallel computing technology. A parallel computer is a set of processors that are able to work cooperatively to solve a computational problem. 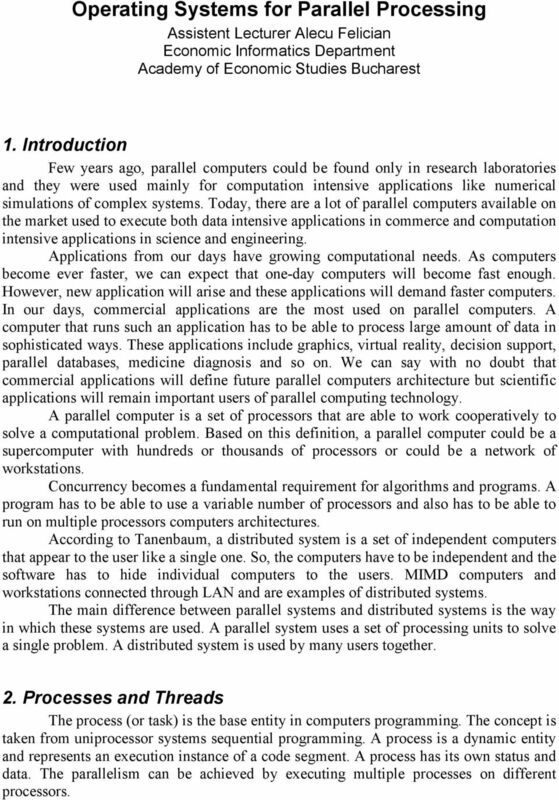 Based on this definition, a parallel computer could be a supercomputer with hundreds or thousands of processors or could be a network of workstations. Concurrency becomes a fundamental requirement for algorithms and programs. A program has to be able to use a variable number of processors and also has to be able to run on multiple processors computers architectures. 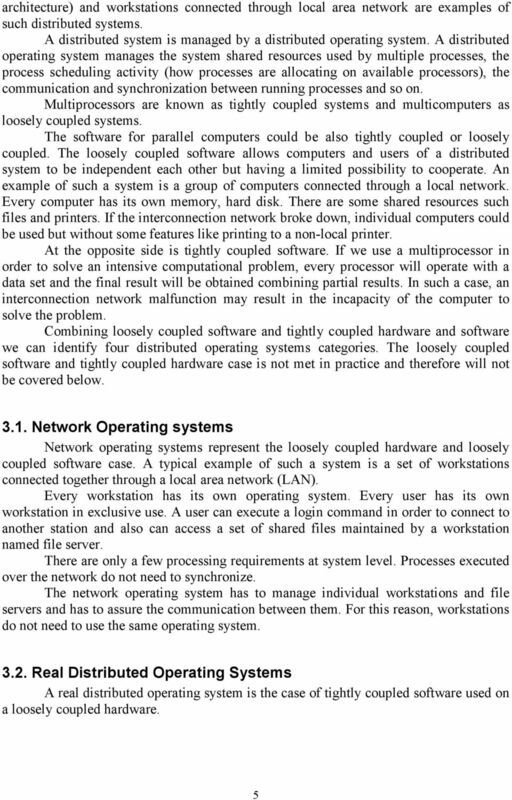 According to Tanenbaum, a distributed system is a set of independent computers that appear to the user like a single one. So, the computers have to be independent and the software has to hide individual computers to the users. MIMD computers and workstations connected through LAN and are examples of distributed systems. The main difference between parallel systems and distributed systems is the way in which these systems are used. A parallel system uses a set of processing units to solve a single problem. A distributed system is used by many users together. 2. 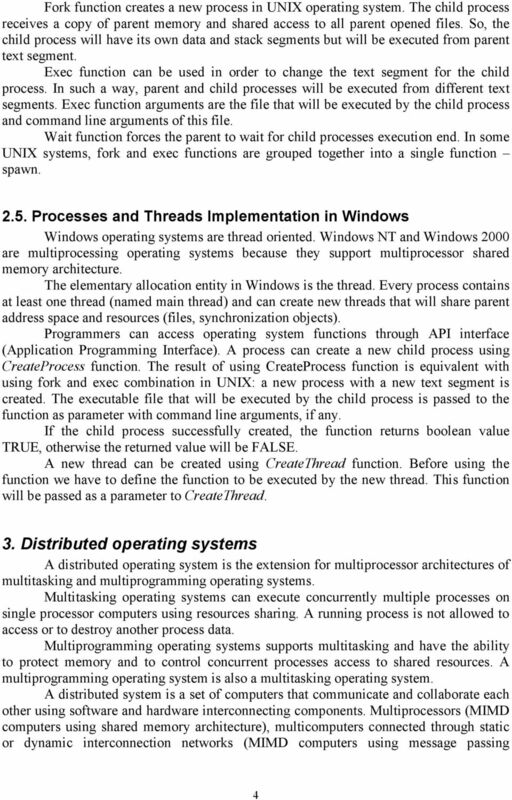 Processes and Threads The process (or task) is the base entity in computers programming. 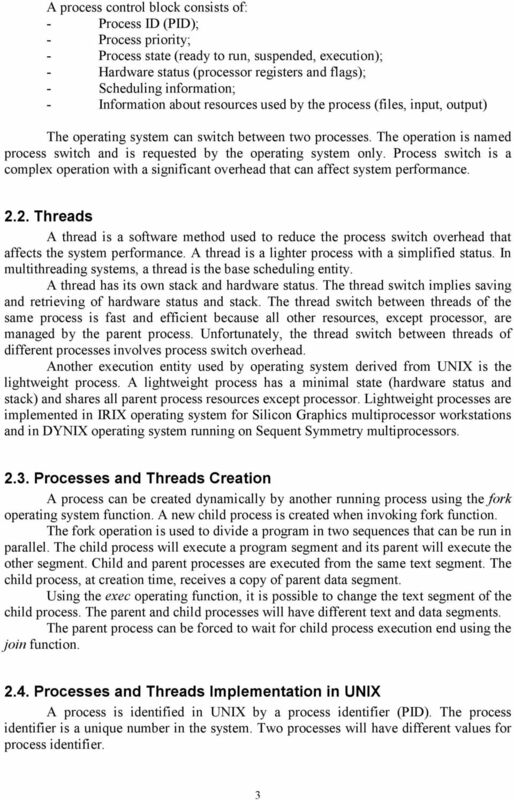 The concept is taken from uniprocessor systems sequential programming. A process is a dynamic entity and represents an execution instance of a code segment. A process has its own status and data. 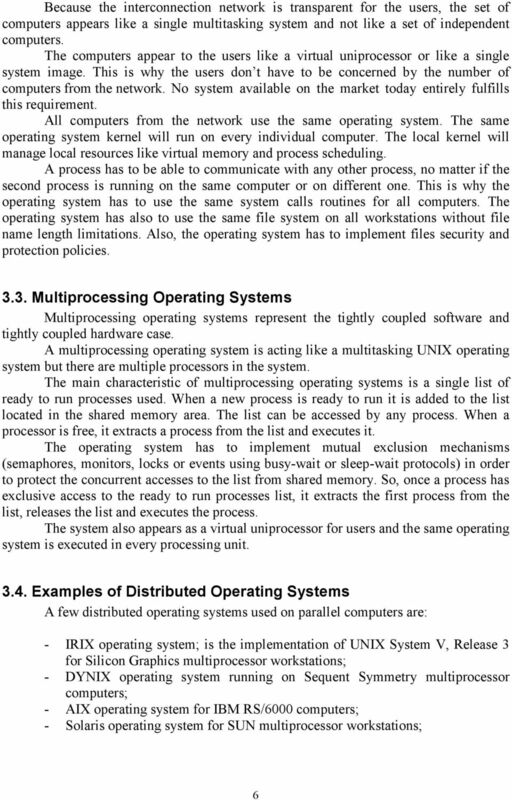 The parallelism can be achieved by executing multiple processes on different processors. 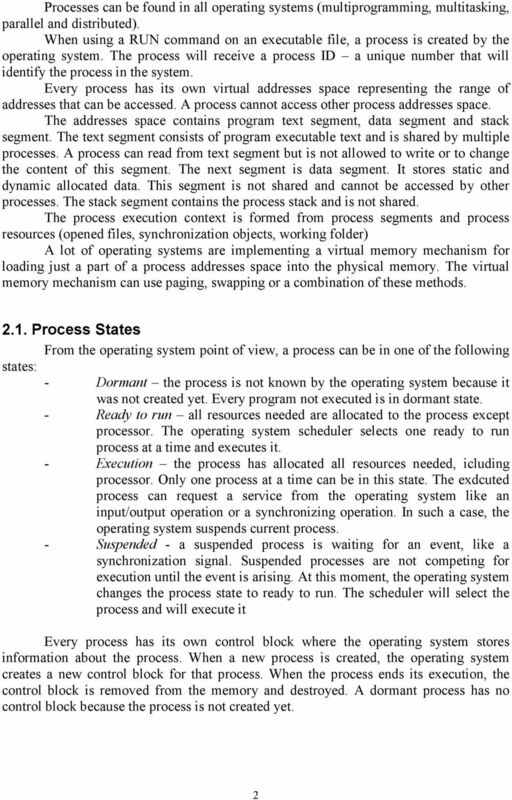 This tutorial will take you through step by step approach while learning Operating System concepts.